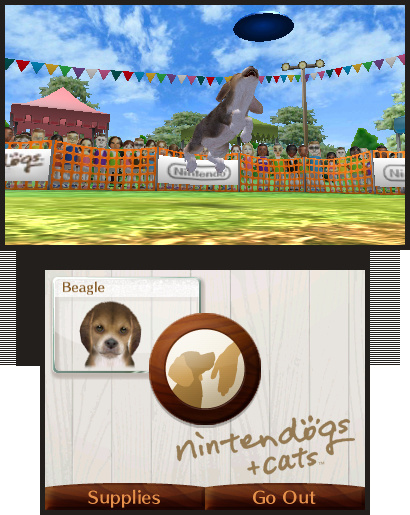 Nintendogs is a worldwide phenomenon, having sold close to 25m units in its lifetime. Shigeru Miyamoto has often spoken of his desire to add felines to the mix, and now he's finally getting his wish as Nintendo announces Nintendogs + Cats on the way for 3DS. Like most of the titles for 3DS at E3 this isn't available in playable form, and no videos have been released, but the increased detail in the beagle's fur is evident. Look closely at the news image and you'll even see Mii characters lining the disc golf area – perhaps a hint that the characters could make an appearance on the 3DS. Check out the screenshots in the game gallery and start picking out names now. Show off the damn cats already, Nintendo. Stop being such a tease. You can see a cat in the background of the second screenshot. I remember when me and my friend saw the interview about this, and the developer spoke of how the pets would react differently to new people, depending on the way they were raised... Some would bark at the stranger and some would approach it, to lick it's hand; in 3D. I lewdly hinted at the perverted possibilities, by reaching for my zipper! We LOLd! I've never really played one of these before, but I hate cats, so I'm glad they're not wasting any screenshots on them. Hey, I think I see Mii in that crowd! Miis on the 3ds would be awesome! I less than 3 the 3DS. Nintendogs is one of the few reviews on this site that I don't agree with after getting my hands on it and playing for a while. I would rank it at 8 or 9. This looks like it will be cool. 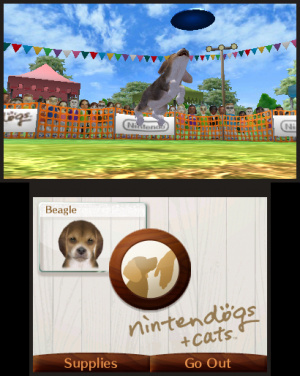 This will be my first Nintendogs game, looking forward to it. What would they call the Miis? Thriis? Diis? Thriidiis?